After hours of researching different hair styling creams, we picked American Crew’s Forming Cream as our choice for best hair cream for men. Hair cream is a popular men’s styling product that offers a light to medium hold with some or no shine for a textured, natural finish other grooming products just can’t compete with. But not every hair styling cream is made with the same non-greasy, high-quality ingredients or gives guys the molding and shaping ability to create the coolest hairstyles. While there are many good styling creams for guys, we ventured to review the top brands and grooming creams. Whether you need a light styling cream for your long hair or a way to soften your thick hairstyle with a natural matte texture, these are the best hair styling creams for men. The best hair cream for men can help guys take control of their hairstyle and get the look they want. If you’re looking to style your hair naturally but need some non-greasy product for a smooth, textured finish, one of these styling creams can work for you. These hair cream reviews focus on the best brands in the industry. While hold and shine were factors, we made sure to take into account scent, greasiness, versatility, washability, customer reviews and ratings, and price. 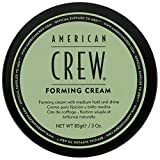 American Crew’s Forming Cream certainly does a good job representing the brand’s reputation for excellence. 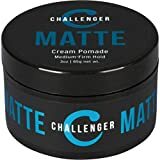 As one of the top companies in the men’s hair products market, this cream serves to soften and hydrate your hair while making your hairstyle appear fuller and thicker. With an all-day solid hold that you can restyle any time, a moderate shine for a sleek finish and a great smell, American Crew deserves to be named our best cream for everyday use. American Crew Forming Cream gives you healthy, tame locks with every single use. The main ingredients in this styling cream fight against unruly strands and help to eliminate frizz for a level of control that allows you to style any hairstyle. Lanolin, castor beans, and flower oil hydrate and condition every strand, so your hair stays in place without flakes, dryness, or damage. 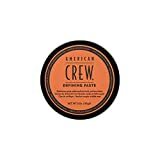 As a versatile product, American Crew’s hair cream works well on a variety of types and textures, from thick to thin hair, as long as you know you don’t need a ridiculously strong hold. Remember, creams are best for some definition and maximum volume and movement. This non-greasy cream leaves no residue, and you can use it effortlessly. However, for optimal results, we recommend applying after a shower when your hair is very slightly damp. Finally, you’ll love American Crew’s signature scent – it’s light and subtle but smells like a good cologne. As a company well-known for their quality ingredients and production, this hair cream takes the top spot – you won’t want to use anything else. Smooth Viking is a company that needs no introduction. This men’s grooming powerhouse is constantly producing top-notch men’s grooming products that go above and beyond, and their Pliable Molding Cream follows that tradition. Smooth Viking’s Forming Cream provides ample hold with a matte finish to keep your style looking clean and neat all day. If you’re an active guy who plays sports or works out, this molding cream will keep your hair in place even when you sweat. Furthermore, this styling cream adds impressive texture and secures your hairstyle by binding to every single strand. Given its strength, it even works well with short haircuts. Say goodbye to excessive shine or residue from low-quality ingredients, the matte finish of this non-greasy product will have you looking sleek without appearing slick. Ultimately, guys with thick or thin hair will appreciate how it feels in their hair. 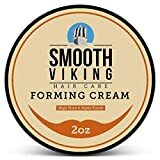 If you need a strong hold but natural texture that doesn’t look overworked, Smooth Viking delivers the best hair styling cream at an affordable price. A little bit of this product goes a long way, and guys with more active lifestyles don’t have to worry about their hairstyles going limp. 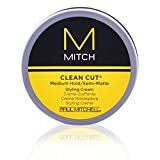 Paul Mitchell is by far one of the most reputable brands in the grooming business, and guys everywhere know they can count on this company for superior styling power. The Paul Mitchell Tea Tree Shaping Cream contains a lightweight formula that provides a strong, movable hold unlike any other product on the market. For the ability to keep your hair styled all day but the flexibility to shape it as you apply, you’ll want to try this highly-rated, incredible smelling cream. As a very popular shaping cream for men, it doesn’t take much for this flake-free formula to get your hair ready for a day of success. This product works well on thick, thin, straight, and curly hair, as it works to keep your hairstyle in place throughout the day without any strays or frizz. The strength of this hair styling cream is impressive, but so is how easy it is to wash out at the end of the day. Besides the great Tea Tree aroma scent, flexible resins and fibers give your hair a matte finish while still providing natural movement, making this Paul Mitchell product another much-needed grooming tool. Use on dry or damp hair, this men’s hair styling cream is bound to turn heads. Although this is one of the pricier options on our list, Paul Mitchell’s Tea Tree Shaping Cream is a high-quality product won’t disappoint. Baxter of California is no stranger to our readers. Looking to deliver intense moisture to your dry hair and scalp? 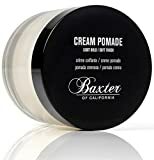 Baxter of California’s Cream Pomade is a product that focuses on the use of natural ingredients to hydrate, style, and completely transform your hair. This cream is the answer to undeniably smooth, soft and textured hairstyles. Baxter of California Cream Pomade offers a light hold that aims to keep your hair manageable without compromising natural movement. It’s probably the best styling cream for long hair. Because it contains natural ingredients that help condition and moisturize your hair without a ton of shine, it’s also a very healthy product to use regularly. Furthermore, it combats frizz at the source, and the lightweight formula isn’t heavy on your hair, making it perfect for medium-length and long hairstyles. However, if you want a messy look, it can also work on short, wavy or curly styles to avoid strays. As a well-regarded brand in the industry with high standards, Baxter of California’s styling cream is worth the investment. Whether you prefer refined curls or tousled, messy strands, this men’s hair cream is set to become your newest grooming staple. 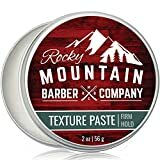 Rocky Mountain Barber Company crafts products inspired by the great outdoors and everything that nature has to offer. Beardsmen will attest to the quality of their creations, and the brand’s hair styling cream continues the tradition. Filled with natural ingredients that won’t damage your hair but instead work to bring texture and control to the dullest of strands, Rocky Mountain’s hair paste is bound to boost your style. Made from plant-based ingredients including Beeswax, Lanolin, and Glycerin, this workable hair cream provides ample hold without the harsh chemicals used by low-quality brands. Plus, their natural ingredients only give off a light, masculine scent that won’t overpower your cologne. This cream has a strong hold similar to gel, minus the sticky residue, flakes and stiffness that typically occurs. And you’ll get the shine-free matte finish that’s easy to wash out. Their quality also stems from their commitment to small batch production. By controlling every aspect of production in-house, you can expect every shipment to perform consistently well. Whether your hair is short, long, wavy, or straight, Rocky Mountain Barber Company’s Hair Styling Cream gives your style the flexibility and texture it needs to stand out. Make your hair stay in place, without harsh, messy chemicals that can cramp your style. Rocky Mountain Barber Company has you covered. Paul Mitchell is a brand you can count on to do grooming right the first time around, with endless successful product lines to prove it. The company’s Styling Cream puts emphasis on shaping and holding up a variety of styles as well as maintaining the health of your hair. This Paul Mitchell product comes with a ton of benefits, and your morning routine will never be the same. The Semi-Matte Styling Cream works on all hair types and keeps your locks in place without appearing stiff. It has a medium hold and a stunning semi-matte finish, allowing you to get a trendy hairstyle with every single use. Not only does Paul Mitchell Semi-Matte Styling Cream maintain your look from day through night, but it delivers necessary hydration to every strand. Active proteins work to rebuild and repair damaged hair, so you know you are protecting your hair’s health every time you use it. Paul Mitchell has definitely produced another shining star in the industry so add this gem to your hair styling regimen for amazing results. Challenger is a brand that understands how to make a lasting impression. Through the use of all-natural vegan ingredients, this product gets high marks and ratings from their customers. Challenger’s Matte Styling Cream is anything but ordinary, and versatile enough to work on short, medium and longer hairstyles. Challenger features a medium to firm hold so it can shape and mold your hair into place for a natural, seamless look. You’ll love the matte finish, which will leave your style put together without any flakes or clumping. This hair cream for men works on all different lengths and textures. Simply apply to damp or dry hair, style as desired, and be confident that your hair will hold up throughout the day. Fortunately, even with its strength, it’s still easy to wash out. With a very subtle, clean scent that smells good, Challenger Blue’s hair cream can stand up against any competing products. This styling product also comes in a travel-sized combo so you don’t have to worry about compromising your hairstyle while on the go. The bottom line is Challenger has nearly perfect ratings from hundreds of reviewers, making it a solid choice. American Crew graces our best hair cream list more than once, making this brand a force to be reckoned with in the grooming world. But you really shouldn’t be surprised given how popular their products have become. Similar to their forming cream, American Crew’s Defining Paste allows you to control your style with a formula very similar to hair wax. This hair paste provides a medium hold, with the main ingredient Beeswax giving your hairstyle natural flexibility. The product goes on smooth without a struggle, and simultaneously moisturizes your locks for overall healthier hair and scalp. The amount of definition is only rivaled by the flawless matte finish. Guys styling a quiff, comb over, messy crew cut, crop top or medium-length hairstyle will appreciate the added textured. Lastly, American Crew’s paste gives your hair a fuller, luscious appearance, and provides the definition you need to rock any look. Lightweight and effective on your desired hair length, type and texture, this pliable hold product offers another dimension to your grooming arsenal. Great memory and hold with pliability. Billy Jealousy is a brand that never skimps on the details. Their Ruckus Forming Cream is specifically designed to make your hair look recklessly flawless in record time. The product features a thin texture so it goes on easy with no unnecessary oils or grease. With high hold and high shine, it pairs a beautiful sheen and the ability to push or pull your hair in any direction. If you’re looking for a tame version of the traditional bed head, Billy Jealousy is about to be your new favorite styling product. The Ruckus Forming Cream give your locks strength and luster, and the flexible yet strong hold is a plus for anyone looking to effortlessly style their haircut. This cream also makes for an exceptional conditioner, giving you a shinier finish than most creams on the market. However, if you want medium to low shine, just use less product or apply on drier hair. This versatile product was made to be used on unruly long, curly, or thick hair. Billy Jealousy Ruckus Forming Cream can hold any style all day long while protecting the health of your hair, making this product a definite stand out in a crowded market. 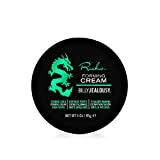 Billy Jealousy Ruckus Forming Cream, 3 oz. Smoother than most other products, Jack Black’s Sleek Finish Texture Cream is made with the finest organic ingredients and no parabens, coloring or fragrance. This flexible lightweight styling cream provides powerful anti-frizz benefits while delivering maximum movement and volume. If you want to control your hairstyle without making it look overly stiff or structured, this cream can help. Combined with a non-greasy, sleek finish, it will completely transform your style. The best part is that applying it delivers a healthy dose of proteins, vitamins, botanical extracts and natural oils for your hair. For example, the silk amino acids will soften your texture while the Vitamin B5 and jojoba oil will hydrate and moisturize your hair. Then the rosemary leaf oil stimulates your hair follicles, the organic olive leaf increases volume, and the beet root thickens strands for fullness. Jack Black’s hair styling cream would be higher on our list of best hair products for men if it wasn’t for the fact that the light hold limits its application to mainly free-flowing straight and wavy hairstyles. Otherwise, it’s seriously one of the highest-quality creams we’ve seen. Men’s styling cream provides a natural look that has movement, flow and volume. In fact, a good hair cream can be useful for guys of all hair types, including thick, thin, wavy or curly hair. From providing volume to thinning hair to giving a light touch to curly hairstyles, cream is one of the most versatile styling products for men. But if you want to choose the right one for your needs, then it’s important to keep a few points in mind. Here are some tips when shopping for a top-rated cream to help you shape and mold your haircut. Different types of styling creams. While there are certainly different kinds and names of hair creams, there isn’t much variation between any of them. You’ll see some brands describe their products as forming, grooming, shaping, molding creams and lotions, but they basically all offer the same level of hold and shine – medium to light hold and low to no shine. Generally, hair lotion gives a lighter touch while options like American Crew are almost like wax. Consider the hold. The best hair creams are volumizing yet offer a moderate hold without any stiffness or flakiness. If you are looking for a firm hold to control coarse hair and style a structured, neat hairstyle like a side part or pompadour, then you’ll need to buy hair wax, pomade, or clay. Otherwise, styling cream is good for shape, texture, and natural movement. Choose between low shine and matte finish. Some of the most popular men’s hairstyles today are all about that textured, natural look. If you’re looking for low to no shine, then a good cream-based product will deliver the results you want without making it look like you have a ton of product in your hair. Subtle scents go a long way. Fragrances are often added to styling products via chemicals. Fortunately, the hair styling creams we are recommending do not smell strongly of potent chemicals. The highest-quality hair creams are scented naturally with essential oils, which are pleasantly fragrant yet never overbearing. Essential oils also help moisturize and promote healthy hair and skin. Identify your hair type. Hair cream effectively adds texture while providing a natural hold on a variety of hair types. Styling cream can help add definition to curly or wavy hair while taking control of frizz. Similarly, it can bring a short hairstyle such as a textured crop, quiff or comb over to life with texture and movement. Guys dealing with thin or thinning hair may find grooming creams to be exceptionally good at thickening hair and avoiding clumping, giving limp strands much-needed fullness. If your hair tends to be hard to manage or style, then we suggest you try a stronger hold product. Now that we’ve discussed the basic factors to consider, let’s explore the best hair styling cream reviews to find the right choice for you! Choosing the best hair styling cream for men can literally revolutionize your look and open you to the possibility of rocking some of the latest cuts and hairstyles. Whether you have short, medium or long hair and want to style a comb over fade, slicked back undercut, a textured modern quiff, or a curly fringe, the right product can get you there.